This Lemony Broccoli Salad is the perfect way to detox and restart after you’ve indulged a little too much! Heads up! I originally published the recipe for this Lemony Broccoli Salad in January 2013. Photographs have been updated. It’s okay if you feel like you need to hit the restart button after the holidays. I know I do. A few too many heavy foods, too much sugar, not enough activity. This salad is helping me with that. Starting over. I’m all about fresh starts. I’m calling it a Restart Salad. 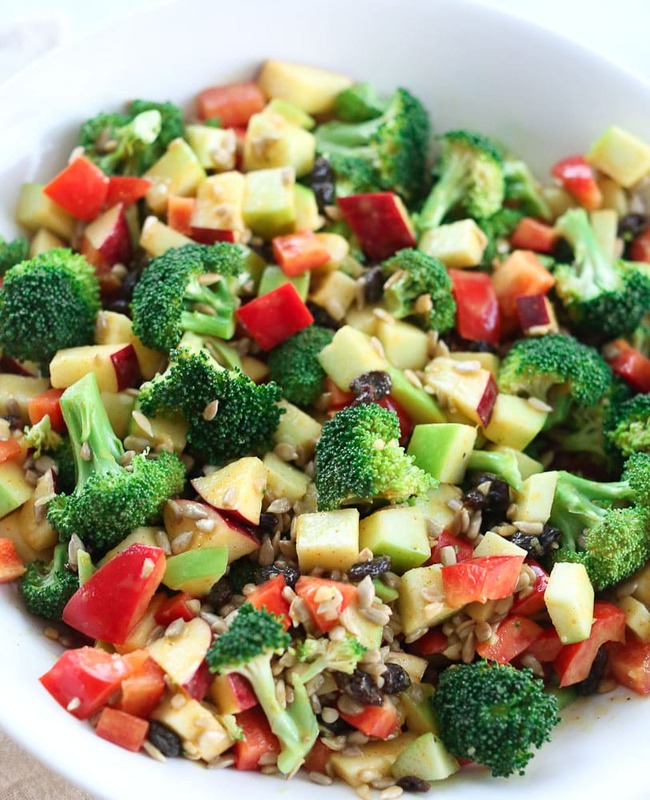 Really, it’s a Lemony Broccoli Salad and it’s full of nutrient-dense foods that will help your body detox. Raw broccoli, seeds, raw garlic, lemon, olive oil, turmeric. These are all foods that will help promote the flushing out of toxins our bodies so desperately need this time of year. I don’t care if it took a tangy lemon dressing for him to eat this salad, because I’ve never seen him eat raw broccoli before. In my book, that’s a win. 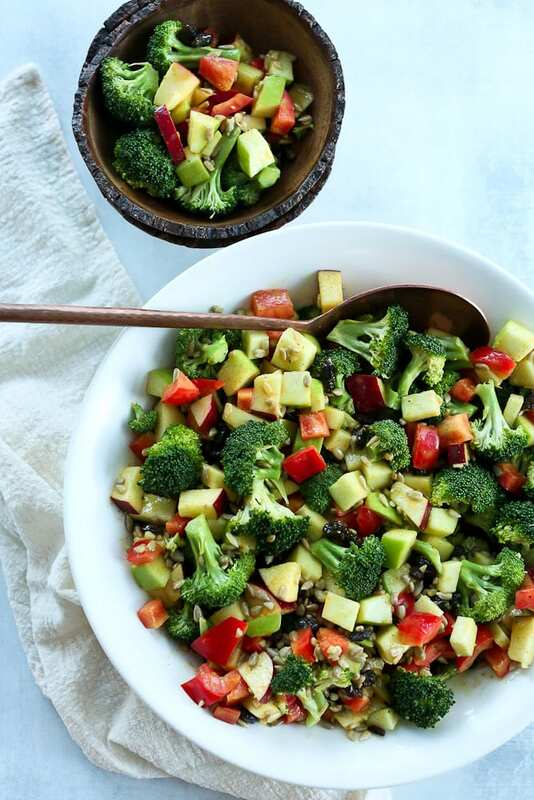 A perfect salad for kicking off the New Year right, this Lemony Broccoli Salad (AKA Restart Salad) is full of nutrient-dense foods that will help detox your body. Make it vegan by using maple syrup instead of the raw honey. Combine all dressing ingredients in a small bowl and whisk together well. In a medium bowl, combine all salad ingredients. Drizzle the dressing on top and stir to combine. Enjoy! *The recipe was doubled for the photographs in this post. You’ll notice I called the avocado and raisins optional. Tim said he prefers the salad without those contrasting textures, but I really like them. It’s up to you if you include them or not. Have a great week! If you make this Lemony Broccoli Salad Recipe, or any Happy Healthy Mama recipe, I would LOVE to see it! Please take a pic and share it on Instagram or the Happy Healthy Mama Facebook page and tag me @happyhealthymama ? I’d call that a win! He ate it and didn’t push it away- it’s harder with the older ones that are in control of their own actions. …..That dressing does sound pretty great! This definitely looks like a fresh start to the new year! Love the colors, Maryea. Happy New Year! Happy New Year to you, too, Alex! This looks delicious. I’m going to pin it right now! Interesting that it has turmeric in it. That is not a spice that I use often, though my doctor said I should due to its medicinal properties. Definitely going to have to make this soon. Thanks for the pin. 🙂 I used turmeric specifically for its medicinal properties here. That it adds some flavor is a bonus. 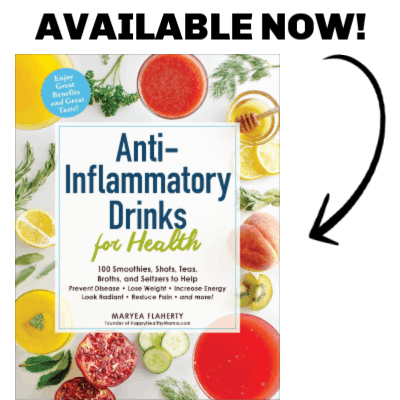 Maryea – I always LOVE your recipes. They are so inspirational!! Craig and I have decided to do a cleanse until our wedding in February and we’re basically no sugar, no wheat, no dairy (except yogurt). I made spaghetti (out of spaghetti squash and fresh tomatoes, garlic, onions, basil and peppers) then added some avocado mashed with nutritional yeast for the creaminess that we’d get from the parmesan cheese. It was delicious! I noticed your comment about turmeric and wanted to share with you the first recipe I have ever made with turmeric in it. It’s so hearty on a cold winter day! I hope you enjoy!!! Thank you Sara! I haven’t had spaghetti squash in a long time. I need to change that! Thanks for the recipe link; I am excited to check it out. This looks fantastic! I liked the husband’s commentary. Nice work getting him to eat broccoli! He thought he was proving me wrong or something. 🙂 So funny. Yum! I definitely feel like I need this 🙂 The contrasting textures sound amazing to me! I just made this for my after- workout meal and it was so satisfying! My favorite part is the creaminess of the avocado tossed in there. Since it was one serving, I cut down on the quantities and then added about 2 tablespoons of the dressing and it was perfect 🙂 Thank you for this salad recipe! I’m so glad you enjoyed it. I’ve been making it every week-I can’t get enough! Yummy. I skipped the pepper. It is great. Glad you liked it. Thanks for letting me know! I keep coming back to this salad! Both my husband and I love it because it tastes good AND is really healthy, it’s a rare combination. Thanks! You are welcome! We love this one, too. Yes, you definitely can make this with lightly steamed broccoli. My husband was the same way, though, and loves it raw! This salad is so delicious. I just made it for lunch and am swooning. I love veggies but don’t normally like raw broccoli. With this dressing it is just delish. Thank you for all your hard work and happy new year! Just made this and it’s the second recipe of yours that I’ve made today. I specifically went to buy broccoli so I could make this 😂 it was totally worth the trip! Thanks again for another awesome recipe!